The poppy is our national symbol of remembrance. Armistice Day this year was special as it marked the centenary of the end of the First World War. On November 11th we remembered those who served overseas, the many lives lost and the hope that peace continues. My Grandfather Joseph McBride went to Gallipoli. He smuggled a forbidden camera inside his sock. My son Ryan and I have reproduced his photo album to share what he saw. The book is ‘Proof of War,’ and on the 12th of November we presented two books to Jeff Smith, Principal, Papanui High School in Christchurch. Joseph McBride was their first Principal in 1936. 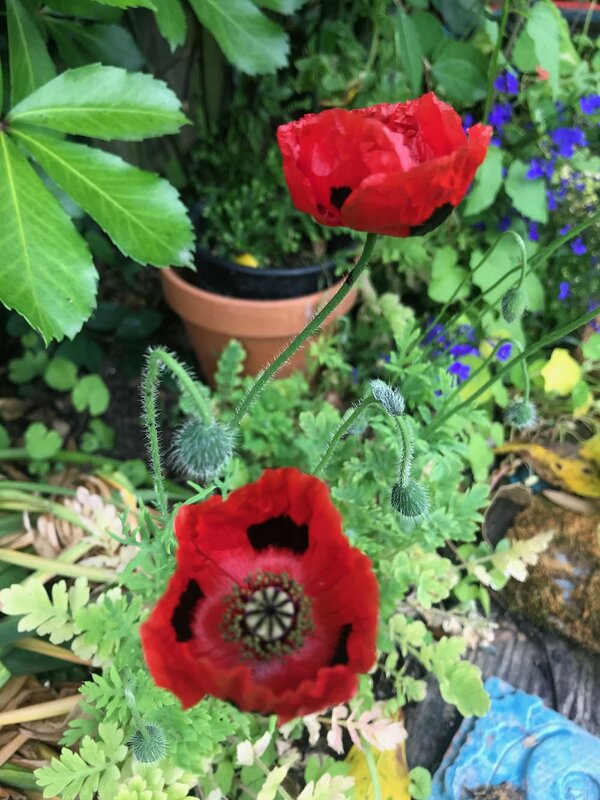 From time to time poppies pop up in my garden and I am reminded of the Canadian, John McCrae, who wrote the poem ‘In Flanders Field.’ The recent Wildflowers Exhibition held at the Russell's property in Hastings had a field of poppies. Old photos have an energy that fills me with happiness. Sepia or black and white they have distinct clues about the era they were taken. The clothes, the stance, the interaction. Dominant genes passed on can show uncanny similarities. “Where does his red hair come from?" These inherited characteristics make you part of your DNA family. Now with DNA testing kits you can have a link to family you never knew you had. I’m about to start using old photos on fabric to create my next piece.